(The Straits Times) — When Shanghai native Summer Li, 36, was in university, she didn't exercise much but was made to run a 5-kilometer stretch of the Shanghai Marathon in 2003. It was scheduled to be part of a live broadcast but there were not enough participants. “Now, it's basically impossible to enter (the race),” said Ms Li, who works as a sales manager for a German multinational in Shanghai. Today, the Shanghai Marathon is one of the hottest road races in China, with the full marathon race — covering a distance of 42.195 kilometers (km) — consistently oversubscribed. Last year, more than 92,000 people signed up for the race when there were only 25,000 spots, which meant for every four people who applied, only one got to run. Li caught the long-distance running bug in 2015 when she ran the Shanghai Marathon to accompany her then boyfriend, who is now her husband. “I had wanted to sign up for the half marathon, but it was hard to get a spot,” she said. Since then, in the three years between 2016 and last year, she has run 12 full marathons. For the second half of last year, she averaged a race a month in a foreign city, the most recent one being the Singapore marathon in December. In Beijing, Singaporean Ang Tiong Lin, 50, vice-president of business development at an IT firm, has also caught the running bug, motivated by the different local sports groups. “I also wanted to test my ability and prove my endurance and fitness level,” said Ang, who has lived in the capital city for more than 14 years. Last year, he started taking part in road races and ran five half marathons and one full marathon in Chinese cities such as Beijing, Wuhan and Wuxi. Before this, the farthest he had run in a race was 10km. Li and Ang are part of the millions of people in China who have found a new hobby in taking part in road races in recent years. According to figures by the Chinese Athletic Association (CAA), there were only 13 marathons held in 2010. The number ballooned to more than 1,100 in 2017, with 5 million entries. This list counted only road races with more than 800 runners and cross-country runs with more than 300 contestants. The association expects the number of races to top 1,900 by next year, with more than 10 million runners crossing the start line. And the industry is estimated to rake in $19 billion annually by then, up from $10 billion in 2017. “The year 2016 saw the explosive growth of marathons among the masses,” said Professor Wang Xueli, director of Tsinghua University's Centre for Development of Sports Industry. She noted that the sport's popularity started to pick up from around 2011 even though China had started organizing such races as early as 1981 with the Beijing Marathon, now considered the most prestigious running event in the country and which has the best brand recognition. Other than big brand-name races like the Beijing and Shanghai marathons, most major city races are also regularly oversubscribed, and require balloting to get a spot, said Zhou Xi, 39, a runner with a local running club in Shanghai. Market analyst Alina Ma told The Straits Times that fitness is “currently trending in China,” with running, walking and jogging as the most common sports activities. “The popularity of running is due to its being relatively easy to pick up, particularly among amateurs, and (the fact that it) does not require any special training, equipment or venue,” said Ma, associate director of research at Mintel, a market research firm. Efforts made by leading sports brands such as Nike and Adidas, whose marketing campaigns introduce new and advanced features of running shoes and apparel, are a factor as well, she added. Analysts and observers noted that many people are drawn to the grueling nature of marathons as it helps them hone willpower and develop self-discipline. Runners tend to have high incomes and high education and the core group tends to be older, above 35 years old, they observed. Prof Wang said “pao tuan,” or running groups, in China play a big part in spreading the popularity of the sport. Unlike running clubs overseas that tend to be more professional, these Chinese groups are usually informal interest groups. Paul Mui, 61, is the founder of one such group in Shanghai which meets every Sunday afternoon at Century Park. About 50 to 60 people show up. 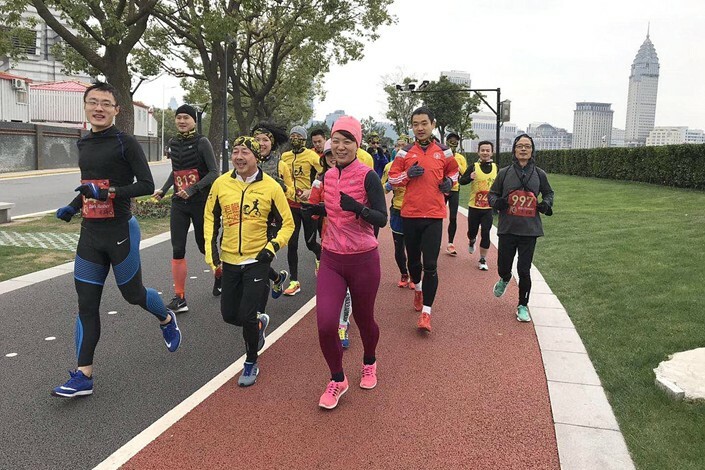 On New Year's Day, he celebrated the 10th anniversary of his group with a 14km run along the Huangpu River at Shanghai's Lujiazui financial center. His group includes 30 men who can run a full marathon under three hours, and six women who can do the same in under 3hr 18min. “In general, we are among the top runners in Shanghai,” he said. Mui, originally from Hong Kong, emphasized that his group is “strictly a running group” that is non-commercial and non-profit-oriented. There are no sponsors. He has funded the activities, including a yearly internal 5km relay race, out of his own pocket. Ten years ago, he started with just one member when he posted on an online running community site to invite people to join him for training. They ran 20km together. With increased interest, the standards have also soared. Back then, he was one of the fastest runners around. “In 2009, if you ran a marathon under three hours for men, people would look at you like a monster. And now, at three hours, you take it for granted that if you train a little bit, you can run under three hours,” he said. “It has attracted a lot of talented people to come out and run, and they run fast. Not only the men, but also the ladies,” he added. In Hangzhou, Fan Bo, 32, a manager at a foreign bank, founded a running group just for women in April last year. Named Happy Unicorn, the group is meant to help women de-stress through exercise. Fan had benefited from the advice, camaraderie and support of local running groups shortly after she picked up running in 2015 and felt it was time to give back. She thinks the social element of running together can help motivate and encourage beginners to train more “scientifically” so as to avoid injuries. But as the sport gains popularity, incidents such as cheating, deliberate obstruction of athletes, injuries and even deaths have started to gain prominence. In December last year, the CAA handed out warnings and punishments to several marathon organizing committees for violations, including mass cheating by 258 runners at the Shenzhen half-marathon in November. Some 18 runners wore fake bibs, while three were impostors and 237 took shortcuts but were caught out by traffic cameras and local photographers. The CAA said it will consider whether to impose additional penalties after the organizing committees and companies submit their reports on how they intend to prevent such incidents from happening again. It is time to regulate the marathon industry in China and to promote the healthy and orderly development of the sport, said the CAA. More than 15 people were reported to have died of heart attacks during marathon races in China over the past four years. Lu Jun, chief operating officer of First Respond, a social enterprise, urged marathon organizers to pay more attention to runners' safety in a recent commentary. “The growth of China's marathon industry has largely outpaced efforts to regulate it. Even as demand for health and emergency response services has spiked, investment in equipment and training has lagged,” he wrote. His organization has provided first-aid training and emergency management services to over 300 marathons in China since 2013. “Ultimately, the safety of an event depends on organizers’ commitment to, and awareness of, these issues. If they try to cut costs on health and safety, the risk of participating rises accordingly. This cannot be allowed to happen,” he emphasized. Runners like Zhou in Shanghai also hope that races can get more professional. Often, the distances at smaller races are not accurate. There is also a lack of mile markers, sufficient supplies and emergency stations. Wang of Tsinghua University noted that more Chinese runners are going overseas for races and more foreign runners are coming to China to race. Local organizers are also working to develop unique or more unusual races that play up the local terrain or conditions. An example is the Great Wall Marathon that is popular with foreign runners. The running times of amateur participants are set to improve further and it would not be surprising if, soon, these hobbyist runners can start to vie for a spot to run in the Olympics, said Wang. Zhou, who took part in the 2018 Boston Marathon, will be racing the Tokyo Marathon next month. She aims to improve her time to under three hours. As for Li, whose personal best is 4 hours 10 minutes, she is content with using marathon racing as a chance to explore foreign cities.